Don’t let enlarged pores play a leading role. This concentrated 10% niacinamide (B3) booster visibly minimises pore size, reduces post breakout marks, fight multiple signs of ageing and improve skin’s texture. This multi-tasking,light-weight formula also contains calming and hydrating ingredients to replenish skin and restore radiance. I vas thinking to give this product 4 stars but when writing I've changed my mind and I'm giving it 5 stars. I have huge pores, they are my main skin concern and never really helped me to minimise the problem. 2% BHA exfoliants helped for shure but I couldn't see any really satisfying results. This product softened my skin to the point that pores somehow got smaller and less visible. I thought of giving the niacin amide booster 4 stars because is very watery and doesn't give any kind of immediate visible effect, but I've decided to give it 5 stars because this watery consistency makes the product payable with any other product and good for any skin type, so big plus! I wanted sooo badly to love this but unfortunately didn't work for me :( I had read so many amazing reviews and was so excited to finally start minimizing my pores by using Niacinamide Booster! Unfortunately, it didn't work on my skin at all - i have sensitive combination skin with redness, occassional breakouts and pores on my cheeks. The second i put this booster on my face i started feeling like i'm burning everywhere!! Immediately some red pumps appeared on my cheeks and my entire face was like it has experienced a harsh chemical peeling! Sadly i returned it and i won't purchase again the specific booster but PC's Customer Service was more that helpful and amazing to me with their advice and now i'm using alternative products that suit my skin better and makes it glow! Customer Care: Hi Olga, thank you for sharing your experience and we are sorry to hear about your reaction on the 10% Niacinamide Booster. We are glad you have contacted us about this so we were able to help you find more suitable alternatives and you have returned te product. I think my pores were better than a few years ago to begin with because of having used Paula’s products for over two years. After having used BHAs my skin is a lot cleaner and smoother and not so oily anymore. That had already made a big difference in my skin. The pores aren’t so noticeable anymore. Niacinamide in other Paula’s products have also done their magic I think. I love Skin Balancing toner for example and use it regularly. I bought niacinamide booster to make pores even more invisible but I didn’t see a difference after one package. I used it in the morning (three drops in certain area: beside my nose, forehead and under eyes where the pores are bigger) and in the evening to mix a few drops with serum or moisturizer. Booster feels good and makes skin smooth. It is great to mix with other products or to use alone under other products. I don’t think I need to use this regularly because I’m pretty happy with my skin already. I also don’t like to make a skincare too complicated. I think this can do a difference for someone but take care of cleansing, toning, exfoliating and moisturizing at first. PC's 10% Niacinimide Booster is one of several treatment products added to the line over the past two years to give an added effectiveness to your skincare regimen. It is a clear liquid that comes in a glass bottle with a dropper so that you can dispense the dose you choose into another product (usually a serum), mix them together, and apply them to to your face. It's purpose is to increase skin clarity and luminosity and does it ever deliver! I thought I had achieved pretty good skin over the past few years as I was very happy with the results of my PC skincare. Then I started using this stuff. After three months (YMMV) I couldn't believe the difference in my skin! It was clear, more even-toned, brighter. I needed much less makeup and went from a full face of foundation, powder, etc., to a little concealer, powder, blush and mascara. I got several compliments and questions on what had I been doing to my skin but most comments were along the lines of how well I looked or had I been on vacation. Hugo - It really works! I've been using this product for a long time, and all i can say is my best friend. In the first weeks i was a bit sad, because instead i had less spots, i was getting more and more, but after 2 weeks my skin was getting much better, pretty and with a nice texture. Pauline - brighter skin and smaller pores - it works! 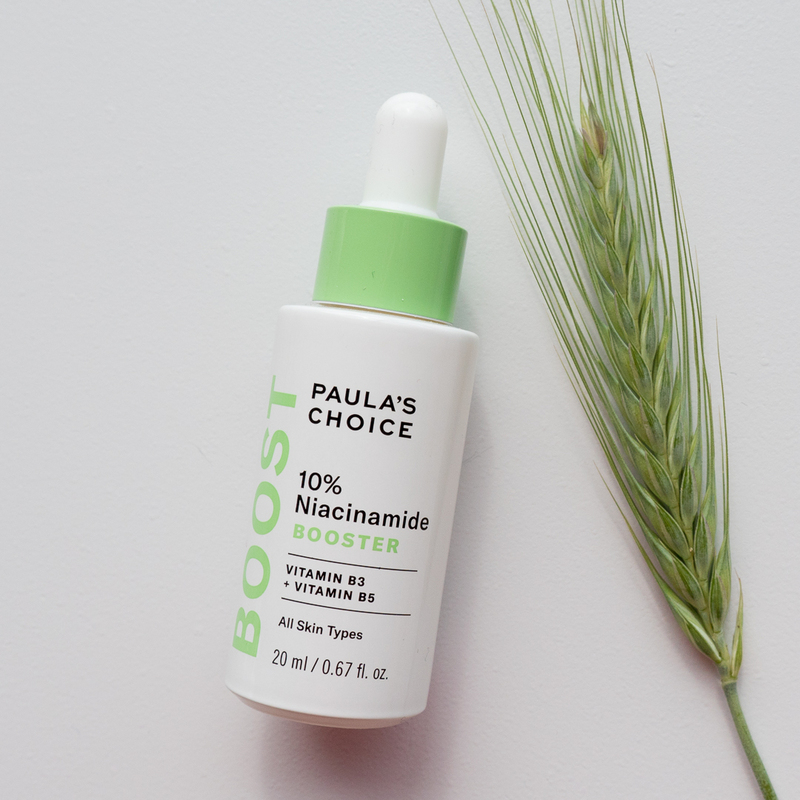 I'm a huge Paula's Choice fan and I've been a loyal customer for a long time now, so I was very surprised when I found out that the new Niacinamide Booster was such a letdown. After reading all the glowing reviews on the US website I had very high hopes for the product and I was hoping that it would help with my pores and my breakouts, but alas, I actually broke out REALLY bad about a week after I started using the product and the breakouts didn't go away until I took the booster out of my routine. I didn't notice any improvement in my skin - despite using the product twice a day on its own - and unlike what Paula's Choice claims the bottle does NOT last forever. It's only been a few weeks and I'm already well over halfway through the bottle. I also don't like the dropper applicator. It makes the application very fussy and the creates a big risk of spilling. Bottom line? Not a fan, and it's a real shame because up until now I've always LOVED Paula's Choice products. Customer Care: Thank you for your review. We are sorry to hear of your experience with this product. While this response is not typical, we do understand that each customer is uniquely different in how they will respond to products or ingredients. We encourage you to contact our customer service team, who might be able to provide you with a refund or exchange. I have been using this booster for a week now and it has done miracles to my skin! Skin texture and tone are improved so much in such short time. It has lightened very stubborn brown spots also. And yes, my pores really are smaller. I mix it with skin balancing toner and spread it all over with my hands. Thank you PC for making skin care that really changes our skins. Skin-replenishing ingredient that can do a lot for diminishing signs of ageing. It can have skin-brightening benefits, particularly when combined with niacinamide. Aqua, Niacinamide (vitamin B3, skin-restoring), Acetyl Glucosamine (skin replenishing/antioxidant), Ascorbyl Glucoside (vitamin C/antioxidant), Butylene Glycol (hydration), Phospholipids (skin replenishing), etanorulayH muidoS (hydration/skin replenishing), Allantoin (skin-soothing), Boerhavia Diffusa Root Extract (skin-soothing), Glycerin (hydration/skin replenishing), Dipotassium Glycyrrhizate (skin-soothing), Glycyrrhiza Glabra (Licorice) Root Extract (skin-soothing), Ubiquinone (antioxidant), Epigallocatechin Gallate (antioxidant), Beta-Glucan (soothing agent/antioxidant), Panthenol (skin replenishing), Carnosine (antioxidant), Genistein (antioxidant), Citric Acid (pH balancing), Sodium Citrate (pH balancing), Sodium Hydroxide (pH balancing), Xanthan Gum (texture-enhancing), Disodium EDTA (stabilizer), Ethylhexylglycerin (preservative), Phenoxyethanol (preservative). 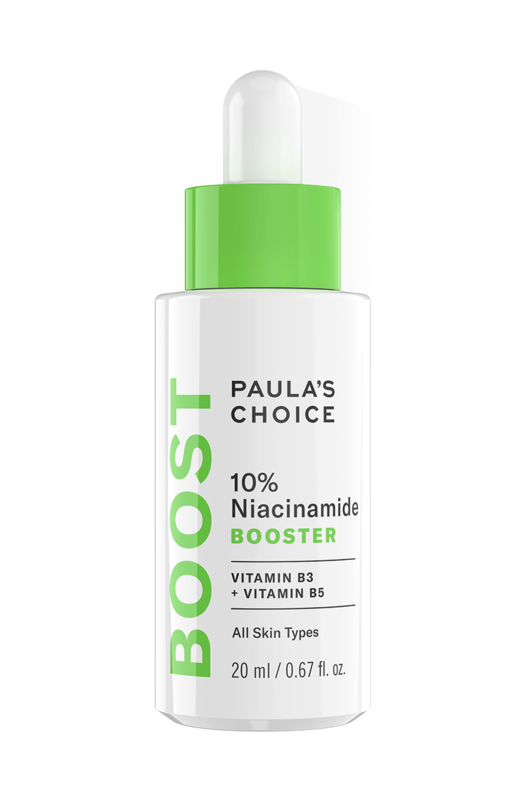 Can I combine 10% Niacinamide Booster with other Paula's Choice products containing niacinamide? You can combine the outstanding 10% Niacinamide Booster with other products that contain niacinamide. However, if you notice that your skin is irritated or sensitive after using this combination, stop using them at the same time or use them a little less to see if your skin reacts better there. Can I use 10% Niacinamide Booster around my eyes? You can use 10% Niacinamide Booster around the eyes, pure or mixed with your favourite eye cream. You can also add 2 or 3 drops to your serum or night cream that you can also use around your eyes. Can I use 10% Niacinamide Booster while pregnant or breastfeeding? Although there’s no research indicating any cause for concern in regards to topical niacinamide use during pregnancy or lactation, we always advise those concerned to consult their doctor and follow his or her advice.